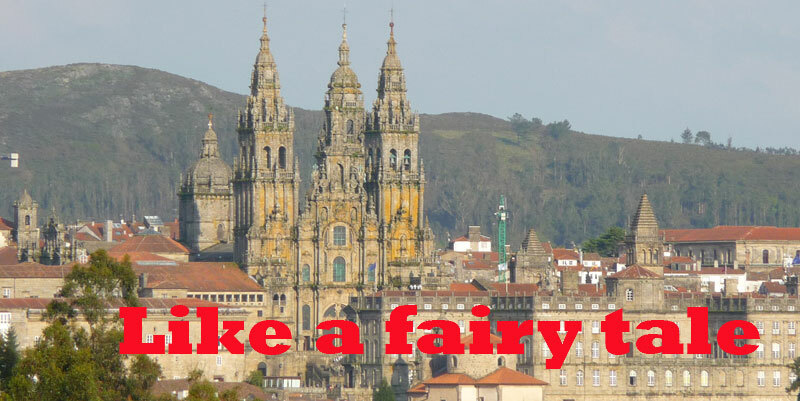 Galicia the hidden gem of Spain, is usually considered as the magic and green part of Spain. No Spanish cliches like bullfigtings or Flamenco dancers all over, not arid lands and grayish soils, but patches of greens tones which dominates the countryside, making the area to be a kind-of-a-sort of the Irland or Scotland of Spain. It´s not only for the landscape but the idiosincray of its citizens who are proud to be lost trace of the Celts and Vikings, with which share an interesting set of legends and traditions ranging from the magical aspects, to the sweet sound of the local windpipe and the wild taste of the “aguardente”, the local whisky. 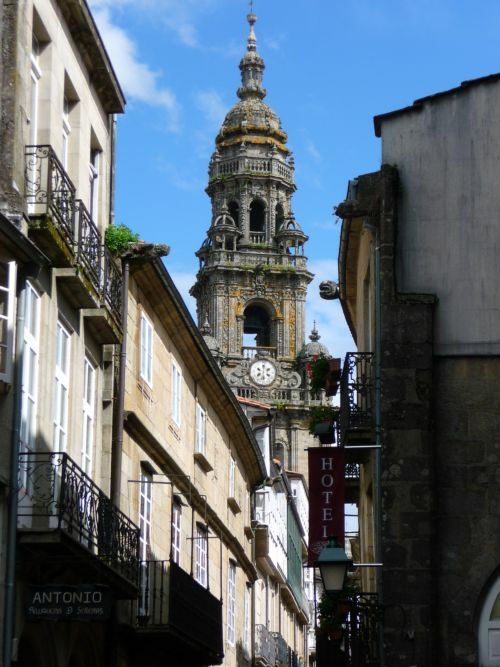 As not a fully touristical destination, most ships get to La Coruña, in the north of Galicia, many of them to Vigo, on the south and close to the Portuguese frontier, and Villagarcia, in the centre of the Galician costline, and the closest to Santiago de Compostela, true historical treasure in the autonomic region. Whatever be your call, Santiago is a must. The approach to the Galician coastline, probably one the most scenic in the world is not to be forgotten, like a filigree, the local fjords (called Rias), islands, and penninsulas, are seemed to be to taken from a fairlyland dream. Rent a car: Most cruisers usually have a few hours to visit Santiago, and although it´s not much time for a complete staying, one could get a glimpse of it. Located at 67 km from Coruña and 88 from Vigo, the Atlantico Motorway it´s like the backbone of the region comunications and goes from the north to the south of Galicia. It´s highly advisable renting a car, and parking it at San Francisco Parking, at a few metres from the Cathedral. 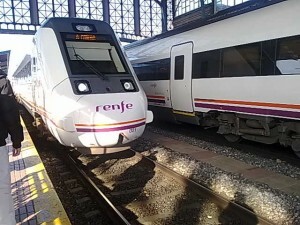 Public transport: Hourly buses and trains run from Vigo and La Coruña to Santiago. Location of train and bus stations in either Vigo or La Coruña from the port varies. Vigo train station is at about 20 minutes walk from the port, alongside the port area, while the bus station is not at easy reach. At La Coruña, train and bus stations are really far away, but opposite each other, just crossing a bridge. At Santiago, the bus station is at the north, the train at the south. The walking distance to the old town is not far (about a mile and a half in each case). The track in under renovation, being the Coruña-Santiago section completely finished. 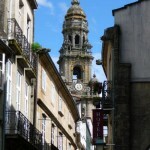 The journey duration is approximately 75 minutes from Vigo, and 40 from La Coruña port. In case we want to use the train, we recommend a taxi directly from the port to Vigo or La Coruña Train Stations for about 10-15 euros (taking about 10 minutes in the case of Vigo, and 20 in the case of La Coruña). Coruña Port is a better choice if you want to get a bus from port to either bus or train stations. From port (Puerta Real) at the row of white balconies houses, facing the port take the bus 1A to bus station (choose between bus or train in the area to get to Santiago) and as you come back, take the bus 5 at the train station to the port (Puerta Real) the same place where you got the bus in the morning. Taxi Vigo taxi drivers offer a fix tarif from the port at 130 € rt, plus 17 € each waiting time, making the best and most confortable way to visit the city for those who can ´t walk too much. You may negociate the same thing at La Coruña. Whatever mean of transportation you use, Santiago is a fascinating city. World known not only for keeping the shrine of Saint James, which has been a remarkable and ancient pilgrimnage destination since the XIth Century, or being the capital of Galicia, it´s one the of the most beautiful UNESCO World Heritage of Spain, as the old town seens to be intact since the Medieval times. Nothing has changed in this eternal and unchangable setting. Like all famous holy cities Santiago has got seven hills. From the top of one of these, we can perceive the whole urban development as an irregular colourfull mantelpiece which spreads along the Mount Libredom like a stone poem. In the middle, the massive catedral towers seen to be the city eternal guards. 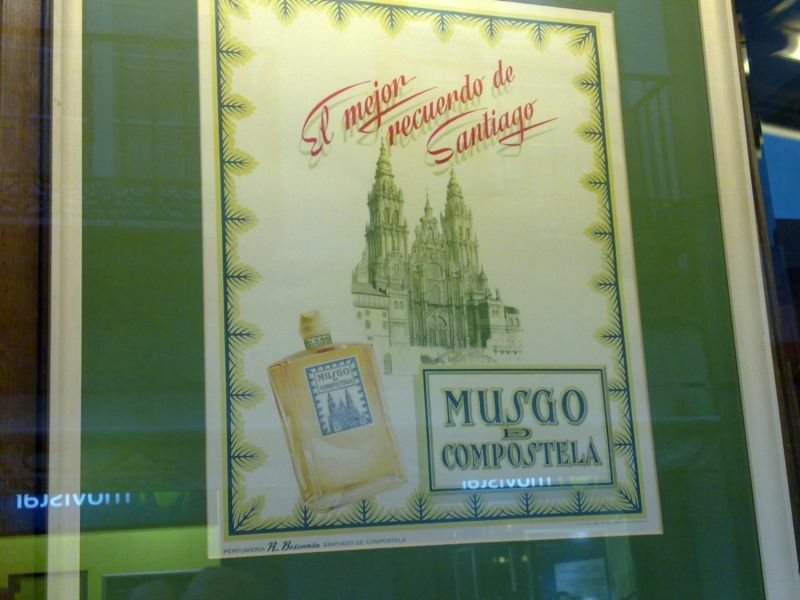 We could even imagine the fascination caused among the pilgrims, who forged the legend of the “Camino”, when they watched the city as they were approaching ,and which made it to be one of the essential part of the whole european culture. With human dimensions, it´s considered to be one of the greenest city in Spain. Parks, fields, and orchards invade literaly most corners of the enchanting city. The old town has always been called by poets the “the Stone Forest”. Unfortunately one only has a few hours to visit the rich heritage of the city. 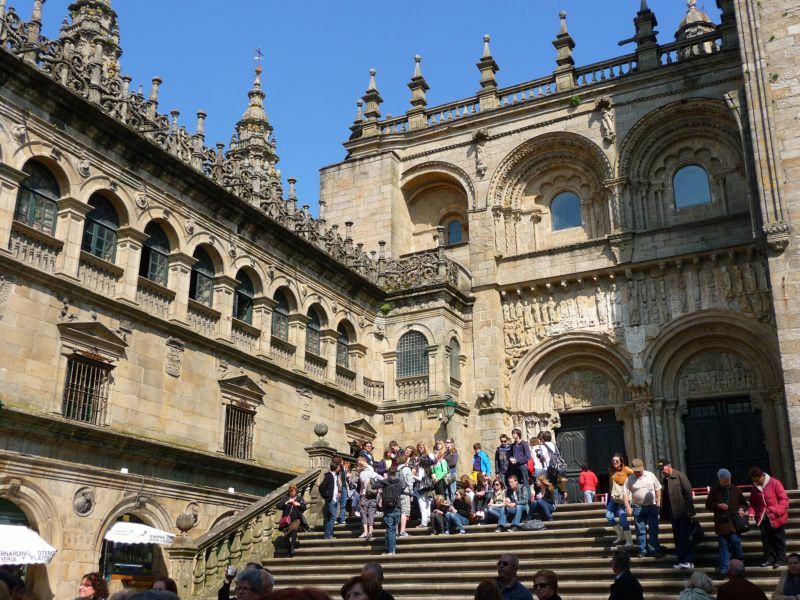 The best way is starting our visit in the epicentre of the city, considered to the Obradoiro Square, in which we could feel the imposing presence of the cathedral. The temple is like a fantasy and has been adopting different styles as a venerable old lady, with dozens of valuable jewels on it. A delightful mixture of styles ranging from romanesque to baroque and neoclassical make the whole square to be one of the nicest sights in Europe. 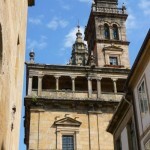 Three other squares decorate the other cathedral fassades. In the vicinity dozens of convents, palaces, churches, make the old town a huge santuary of art. 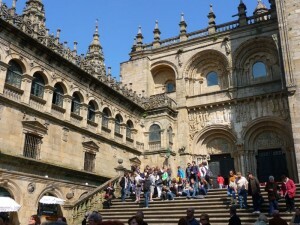 The cathedral was started in the XI century. Then visit to the Cathedral, Saint James burial place, and the cathedral museum, Archbischop Palace and the cathedral roofs would take you a couple of hours. 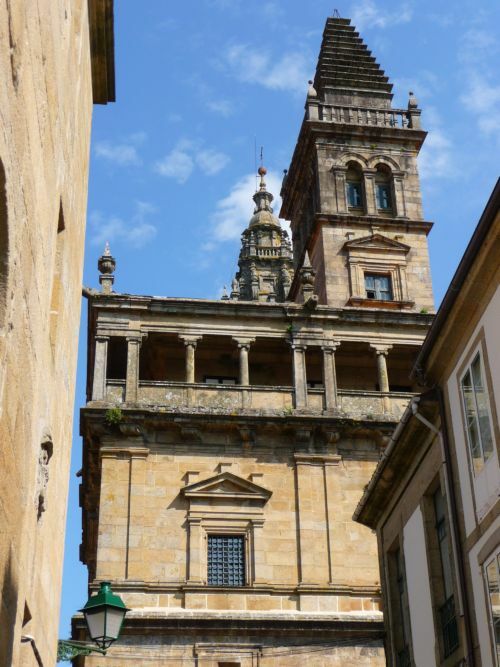 Don´t miss the usual pilgrim cerenomy: the saint hug, the Glory Porch, and trying to watch the Botafumeiro flying along the cathedral as the biggest incensary in the world. It´s not a daily ceremony, but it usually flies after the Pilgrim Mass at 12:00. Then it´s time to go round it visiting the Platerias Square with the nice Berenguella or Clock Tower and the Horses Founting. Then, the back is dominated by the Quintana Square, ideal for a coffee in the open air coffeeshops. The last one is the Inmaculada Square, in which it´s impossible to pass by without having a look to one of the biggest monuments of the city. San Martin Pinario Monastery, in which the church is a must. To get to the church walk along Azabachería, turn right at before getting, visit the Casa da Troya, an old student inn, preserved as it was in the XIX century, and which is a fine example as how the students lived in the past century. 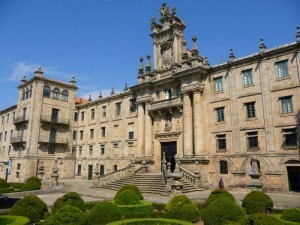 Remember that the University of Santiago, is one of the oldest in Spain. In other times, there were Tuna (musical groups of students, dressed in old way, which played along the city). We still have some playing around but it´s not easy to see them at the old town. Then come up along Azabacheria (Jet Stone Museum, the local handicraft on the left hand side, it´s a good place for local shopping. Just opposite the Museum at the armonic Cervantes Square, we recommend a visit to “Cepeda Food”, the best old fashioned food store in town. A local shopper which is still proud to sell food in the old way. Local deserts, wine, and liquors are recommended. Behind the San Benito Square I recommend the local market as the second most visited place in town. No many places like the Plaza de Abastos. Local growers sell their products directly, and it´s a pintoresque place full of typism and colourfull images. Then it´s time for walking around. Santiago is a huge complex of alleys, porched streets, paved stone street mixed in a way which is hard to find anywhere in the world. But more than art, it´s a city of feelings. The stone seem to be alive when the perpetual rain tarnish all corners with a glossy coat of water which makes everything to glow. The water produce magical reflections of stories, people, ghostly silouttes and other city elements. Sounds as the bell clock striking the hours, the steps of people in the tiny alleys and familiar flavours as the chocalate coming from place traditional places like Iaccobus, and the noise of the pilgrim sticks hitting the stones mixed with the laughter of the university students. It´s a place to live, feel and enjoy. It´s a city of conspirancies and slow walking. 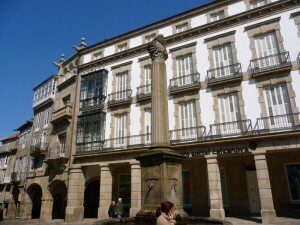 The main pedestrian areas are Rua Nova and Rua do Villar, paralel streets starting from the Platerías and Quintana Squares. 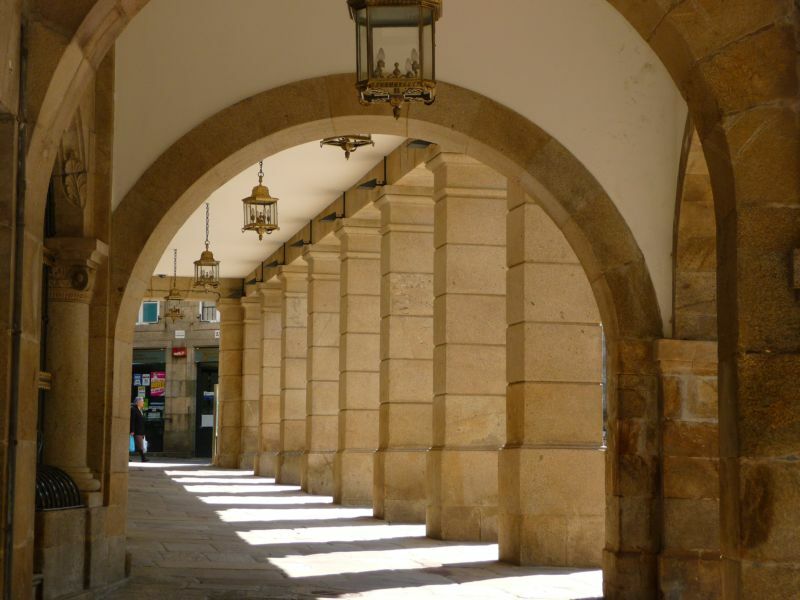 The traditional old fashioned pedestrian streets, in which we could see the most beloved elements of the city´s inhabitants. Watch the Principal Theatre, Casa Mora Bakery, Salomé Chuch, or jewelries for the perfect gifts. 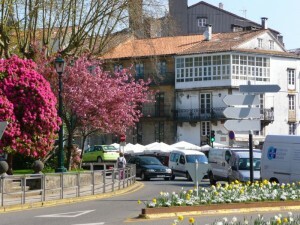 The tourist board lies at the end of Rua do Vilar. The most impressive place for pictures, is the Alameda. The nicest romantic park in the city. From Herradura Promenade you could have the perfect pic of the cathedral. Local food could be found in el Franco Street. Before getting into the Park, and if the weather is nice, the Avenida Figueroa, is full of outdoors sitting, cafés, and local life. It´s the beat of town. For all those who have been in the city before there are some out of the beaten track sights. What about visiting splendid parks?. 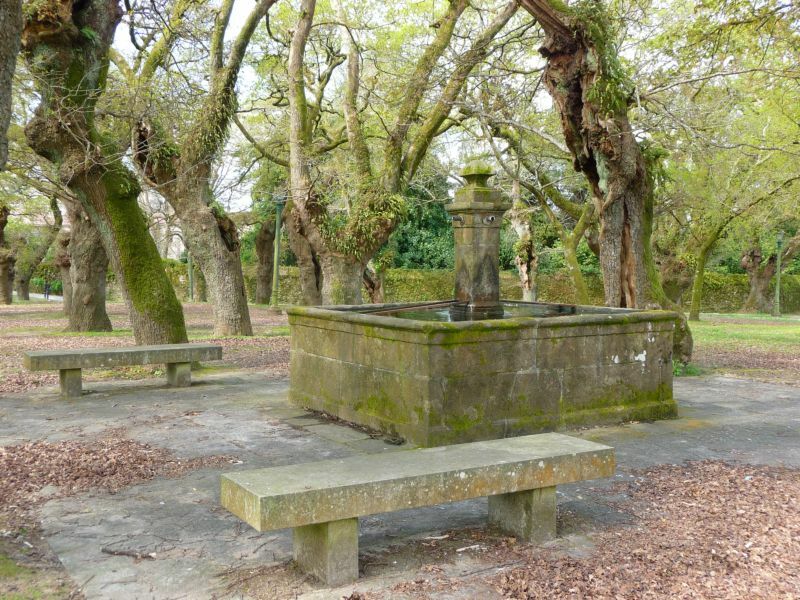 (Try Parque de Europa with some fine examples of modern architecture, Parque de Bonaval designed by a famous artist close to Porta do Camino, Parque do Restollal, or even getting a cab and getting up to Monte Pedroso, the highest point in the ciy, and which offers a fantastic view. Quiet places?. The banks of Sarela River, is a pristine place to relax, breath, and track along pedestrian rural alleys. What about a museum?. 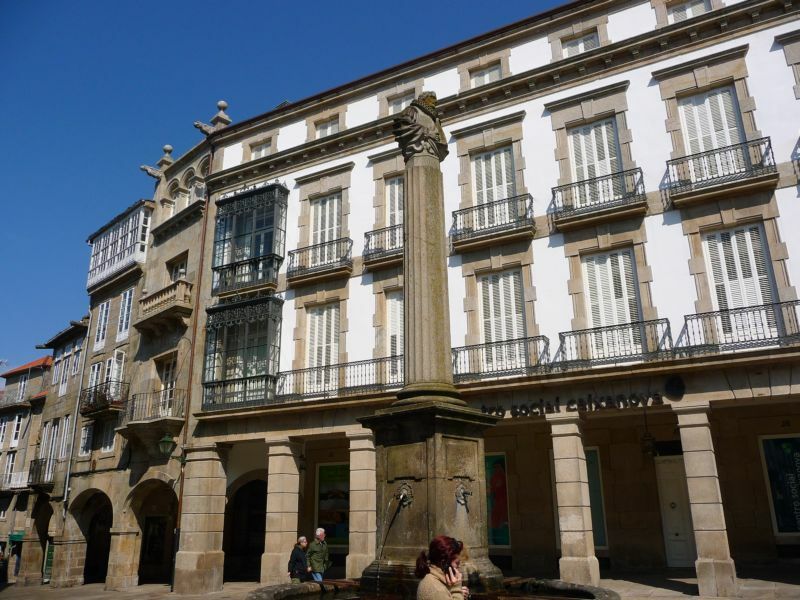 I recommend the Museo do Pobo Galego, probably the best example to know a little bit about how the galicians are, Museo das Peregrinacions opposite San Miguel Church. The highest spot is the City of Culture (Ciudad de la Cultura). Our local Guggenheim. Peter Eiseman is building a huge cultural complex, whose building are already being an essential part for all those interested in modern architecture. No too many people, know that we have a local “Pisa Tower”. Sar Church is so inclined that it´s hard to believe why it stands. –Tradicional celtic objects: The celts were the original settlers before the Romans came to the area. The city itself started as a Celtic settlement localed in the food market. So there´s a wide range of handicrafts with celtic patterns specially jewelry. I recommend the following places which also sell other tradicional examples of the Galician culture. Amboa at Rua do Vilar, A Mouga at Costa da Conga. –Sweets. Sweet-tooth?. You´re lucky we love sweets. 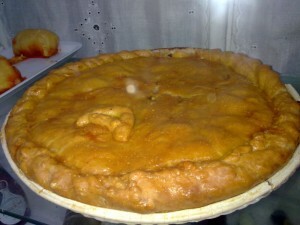 Almond pies is the local cake. Nice, but don´t expect to find real flavours and quality in some local sellers, which offer you to sample them at the street. 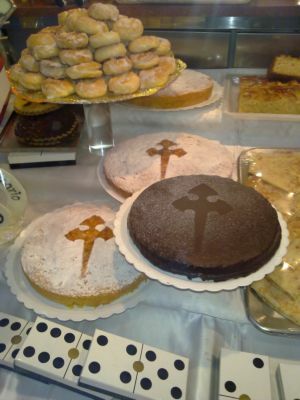 There are some convents which still offer good homemade cakes, like San Pelayo, or Belvis. You know: Tradicional way: you have to ring a bell and a nun will talk to you from the other side. Almendrados. 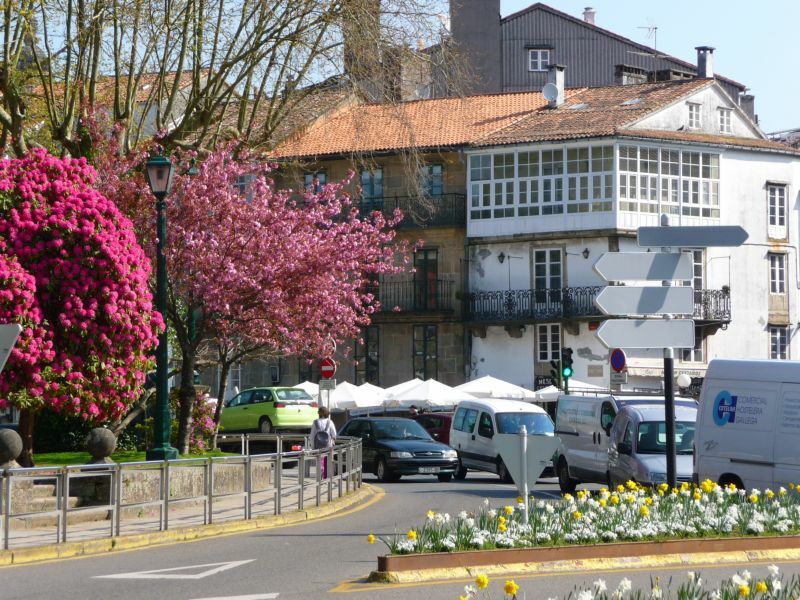 Then chocolate: try Pedras de Santiago, and the small chocolate shops from Casal Cotton at the end of El Franco which sell the nicest chocolate in town. Casa Mora in Rua do Vilar is one of the oldest bakeries in town. Despite the modern look, they still sell home made almond cakes or Tartas de Santiago. –Jet stone handicrafts: The tradional stone for local jewelry. The visit to the Jet Stone Museum at Azabachería is a must. 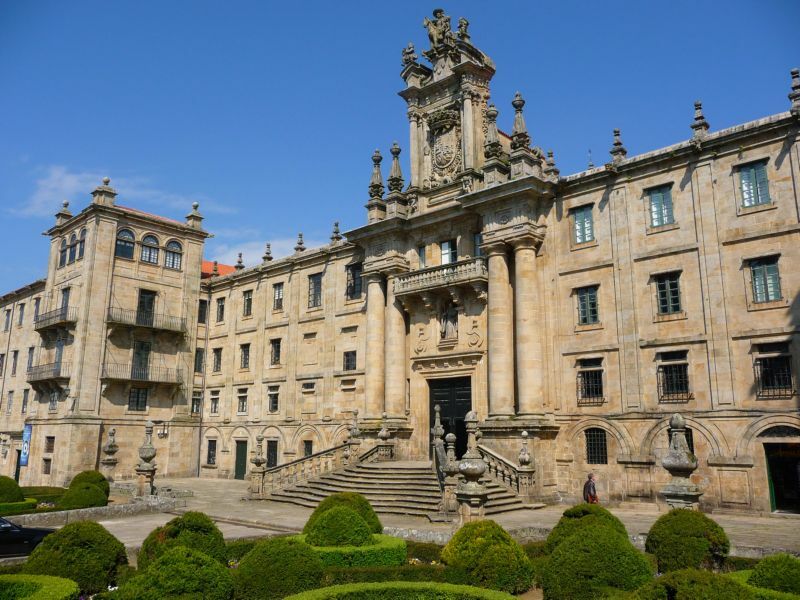 The museum is located in a lovely XIX century arched palace which contains an small stunning exhibition hall with temporary exhibitions and a permanent one dedicated to the Portigo de la Gloria in the cathedral. –Lace. The place for bobbin lace. Other of the Galician tradition, called Camariñas Bobbin lace,. 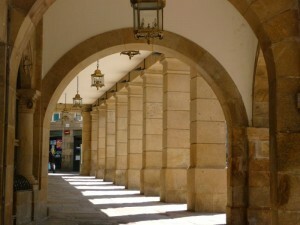 The main shop lies at the end of Rua Nova, under the arch. Delighful shop with usually high prices. The perfect place for buying something special. –Traditional China. The local one is the vanguardist “Sargadelos” They may be a bit odd at the beginning, but they are absolutely peculiar. The main retail is located in Rua Nova. 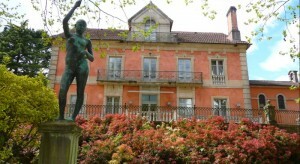 –Galician music. Forget about flamenco over here. 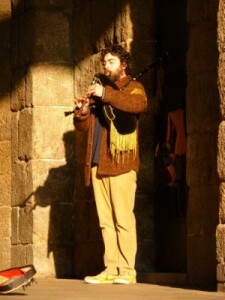 We don´t hide it, but our roots and music resamble to Ireland, and you should bring some relaxing celtic music with you. Windpipes, flutes, and a lot of melancholic tunes will make you feel like in other places. –Books: The biggest book shop is in Plaza de Cervantes. Although they have a huge amount of books in the Galician language, is the perfect place for pictorical books about Galicia, cooking, history, traditions and legends, guides. Don´t expect to many books in English. –T-shirts: You will be able to find many traditional ones, in the souvenirs shops. 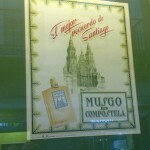 For something more stylish try at the shop next to San Pelayo Church (Via Sacra, on the corner). They make their own designs related to Santiago, and “The Way”, and print thenselves on the tshirt, having to wait for some minutes. Next to the shop you could try a local beer at Casa Das Crechas, one of the nicest local bars in town. Estrella Galicia is the local beer brand. Local cuisine is probably the best in Spain, not only for the preparation but for prime quality ingredients used. Galicians are the biggest consumers of fish and seafood. So expect all kind of delicacies where “Pulpo a Feira” (sliced optopus, with potatoes olive oil, paprika and salt), is the one of the most traditional meal. Fine vegetables like “pimientos de padrón”, “grelos” (local vegetable similar to Spinach and used for Caldo Gallego-Galician soup). Veal is excelent as well as other meats as pork, pouldry and cheeses are exquisite. A bit soft and bland, but very nice to try with “membrillo” (local thick mermelade). We usually love “slow food” concept. Which mean “ir de vinos” (wine drinking) in different places specially along Calle del Franco, and sampling free tapas or asking for inexpensive “raciones”, small meals to share.Try “Empanada” ( a kind of pie made with different fillings essentially cod, meat, or tuna). Drink albariño wine, and liquors like “Aguardente”, is perfect after a big meal. In case of just a coffee break, Casa Mora offer nice desserts, as well as Airas Nunes both at Rua Do Vilar, and in the last case the best chocolate cake in town. Café Casino is the oldest coffee shop in town, and it´s the tradicional old european café (at Rua do Vilar). For chocolate lovers, don´t forget trying a Metate (chocolate and cream) in Metate Café at Calle Preguntoiro. -Emergency numbers: 091/092 (for the local and national police). The Police Station is at the Republica Argentina Street (old town) about to be changed to Plaza Figueroa. Medical emergencies 061, or 112.
hola acabo de enterarme de tu website y la verdad es que me parece genial no sabia de mas personas interesadas en estos temas, aqui tienes un nuevo lector que seguira visitandote abitualmente. Gracias. Intentare estar a la altura. Exactamente donde puedo encontrar esta plataforma Weblog particular para blogs.elcorreogallego.es ? . saludos!